Billy Bragg Covers: The Beatles, The Smiths, Seeger, Guthrie, etc. The coversongs of Brit-folker Billy Bragg have been hovering on the edge of my consciousness for decades. His lovely, raw cover of She’s Leaving Home was the earworm on 1988’s alternative UK-band coveralbum Sgt. Pepper Knew My Father. His folk-pop work interpreting the lost works of Woody Guthrie in the late nineties reminded me of the genius of both Bragg and genre-defining alt-country musician Jeff Tweedy even as the albums brought the musicians themselves from fringe fandom to full-blown mass market appeal. Then today, as I crested the mountain in the frigid New England winter air, our local early-morning folkshow played Bragg’s now-seminal, pained 2002 version of Smokey Robinson and the Miracles’ Tracks of My Tears. And I knew it was time to pay tribute to the collected covers of a man who’s made the journey from punk to folk, and come out smiling, without losing his radical political heart. Ladies and gentlemen, Billy Bragg: folksinger, cover artist, and man of the people. 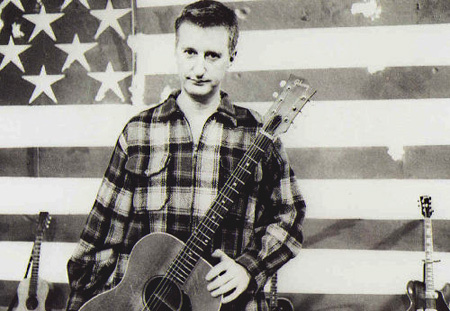 Billy Bragg’s bio describes his early work as that of a one-man Clash, an electrified punker with singer-songwriter style. More generally, he is often categorized as anti-folk, though his early work is punk folk, an umbrella that includes such smashingly loud, mosh-pit bands as Flogging Molly and The Pogues. His politically charged lyrics and angry street-broken voice are known for how they speak to the plight of the working class, while making explicit reference to a political arena which is both resonant with and alien to the American ear. Perhaps because of this tendency to ground himself in the styles and politics of the United Kingdom, for most of his career, Bragg’s work didn’t show much on this side of the Atlantic. I first heard that Beatles cover, for example, on imported vinyl brought into our home by my younger brother, who was primarily in it for the much weirder stuff. But while it’s true that Bragg still shares an anarchist’s sensibility with his fellow folk punk luminaries, in his later years, like fellow countryman Elvis Costello, Bragg has mellowed out musically, joining forces with Wilco to pay tribute to one of the seminal authors of the great American songbook, and turning his voice, already torn from the anger of his early punkfolk days, to an almost Americana sensibility. The combination of new sound and old credibility, of socially aware soul and mellow mature interpreter, fits perfectly into the modern post-folk world of Grammy recognition and blog cred. It says what it needs to that when no less an authority than Woody Guthrie’s daughter Nora was looking for someone to write music for two albums worth of unset Woody Guthrie lyrics, she considered Bragg enough of an inheritor of the Guthrie voice-of-the-people, politically and musically, to ask him to do it. This is Bragg’s quieter work, to be sure, though I’ve planted some of Bragg’s harder stuff in the bonus section below. The lush fiddle and plainsong treatment of Pete Seeger is more churchmusic than mosh pit; his version of When the Roses Bloom Again falls towards the country ballad side of alt-country. But listen for the yearning, the core of that politicized soul, and you just can’t miss it. Today’s set even begins with that Beatles cover, a harbinger of the softer artist to come: beautiful, broken-voiced, and unequivocally Bragg. Most of Billy Bragg’s work has been rereleased since his turn-of-the-century Grammy nominations; his back catalog is an incredible journey, if you’re up for the boxset collections and compilations. But no matter whether you choose his old work or his new, buy Billy Bragg’s work direct from the source, not the megastores. It just wouldn’t be cricket, otherwise. Jonah Matranga and Frank Turner’s indiefolk approach to A New England.